The June 1930 issue of Science and Invention magazine featured this amazing little pocket projector. But much like other small handheld gadgets of the time, it was pretty impractical given its battery needs. 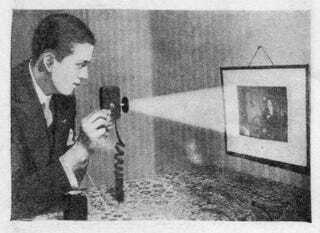 A complete pocket-sized motion-picture projector has been introduced in Berlin, and has become very popular there. Current is supplied by a battery that fits the pocket and will permit enough current to be drawn therefrom to light the lamp of the projector for 200 exhibitions. After this, the battery must be changed. The pictures can be projected as large as a picture frame and the novelty itself sells for but $5.00. Notice that they call it a novelty. And perhaps the most important question, given its size: how long could the film inside be? It's like a Vine from the 1930s! ...or something.